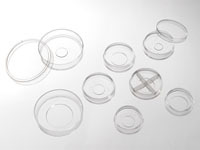 Petri dishes/plates with micro-well are directly injection molded using virgin poly-styrene. Directly injection molded dishes/plates offer better precision and reproducibility	than manually cut dishes/plates. Dishes/plates are tissue culture treated to allow healthy growth of cells on the plastic surface (This does not apply to chambered cover slides and 6/12/24/96/384 well glass bottom plates with full glass bottom). A USP class VI adhesive is applied to the dishes/plates. The adhesive is extremely resistant to water and other commonly used solvents such as methanol and ethanol, that makes our glass bottom dishes and glass bottom plates better suited for long-term tissue culture and subsequent assays. A German cover glass is attached to each dish/plate/slide. 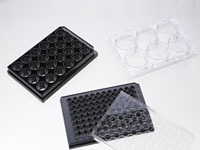 German cover glass is believed to be better for growing finical cell lines. It has low absorption within the visible light spectrum (for #1 cover glass, less than 10% for wavelength > 400nm), and high absorption for UV light (for #1 cover glass, over 90% for wavelength < 300nm), which is ideal for fluorescent microscopy. 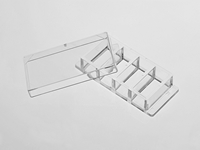 Finally, packaged in easy to open sleeves/trays and sterilized by γ irradiation.